Ah, autumn … a time when the nights begin to draw in, and a touch of frost chills the air. In defiant response, Pittsburgh CLO Cabaret presents the high-voltage, high-concept 2005 off-Broadway hit Altar Boyz in a production sure to blast away the cold. 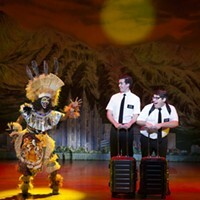 Kevin Del Aguila wrote the book and Gary Adler and Michael Patrick Walker supplied the music and lyrics for this bright, relentlessly energetic parody, which became the ninth-longest-running off-Broadway show in history. 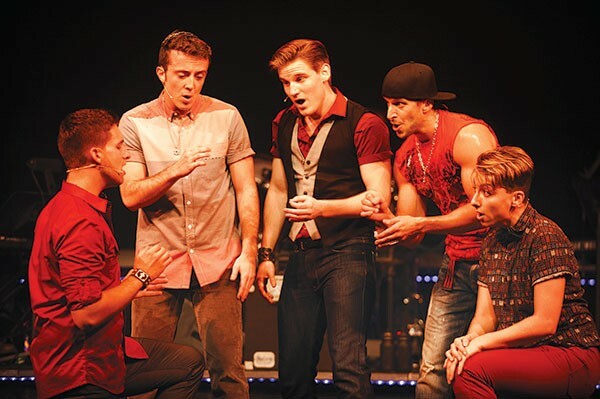 The evening is a concert presented by the Altar Boyz, a Christian boy band out of Ohio giving the final performance of its nationwide Raise the Praise tour. 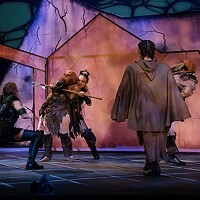 The singers plow their way through 12 numbers in 90 intermissionless minutes, with an occasional scene where we learn how they found each other and, ultimately, what’s going to happen when the lights go down for the last time. Del Aquila’s book is funny and sharp, and the music by Adler and Walker both lampoons and salutes high-octane pop rock. And all of it is put together with the simple goal of being insanely entertaining. CLO Cabaret director and choreographer Carlos Encinias is something of an Altar Boyz alum, having directed several productions around the country as well as having appeared in the show during its off-Broadway run. That goes a long way in explaining why this production is so slick and precise; on some level, Altar Boyz is also a contemporary dance show (the boys never stop moving), and Encinias does a masterly job recreating Christopher Gattelli’s original choreography, which is ferociously danced by Carter Ellis, Michael Greer, Michael James, Javier Manente and Mason Alexander Park. Each of these five gets a chance to shine on his individual solos, with a superb band comprising Robert Neumeyer, Catie Brown and RJ Held. Their comedy scenes also deservedly get a lot of laughs, but I return again to their work as dancers and the remarkable job they do. This production is sure to chase away those autumnal blues.